I last wrote about the Dexcom Continuous Glucose Monitor (CGM) on 11 December, 2017. In that post, I highlighted what it was like after a week. The first week was not without hiccups, and the following few weren't perfect either. Things have improved dramatically after almost two months of wearing a CGM. The idea behind this post is to share things I've learnt that weren't obvious from the beginning. These are the things that had I known in December, would've made the first few weeks with the CGM a lot smoother. Your mileage may vary, but this is a collection of what has been working for me. Get your overnight blood sugar level right. That is the single best piece of advice I can give. The biggest annoyance I had with the CGM after a week was the alarms - especially overnight. There's no such thing as perfect control, and things are going to go wrong, but if you can stabilise the night as much as possible, it'll make your life easier. If you've got a CGM, chances are you're controlling your blood sugar levels through an insulin pump. It's important to fine-tune your basal insulin to a rate that will keep you steady overnight. Easier said than done, of course, but if it works 5 or 6 nights per week, you'll be well on your way to having an easier time with the CGM. Being woken three nights a week is no fun for anyone. But how? Before getting a CGM, I would've told you that it was impossible to have consistent levels overnight. I've since learnt this isn't true. I noticed a correlation between the nights I had stabilised my blood sugar level before sleep (i.e. Was hovering at a constant level, and had no active insulin - this was key). Short-acting insulin stays in your system for just over three hours, so it's important to avoid eating carbs up to three hours before sleeping. I've changed habits to have dinner finished by 7 pm at the latest so that insulin is out of my system by 10 pm. Now I know that if by 10 pm my blood sugar is between 5 & 7 mmol/L, it's unlikely to fluctuate, thanks to no active insulin, and a good basal rate. The result? Hours of uninterrupted sleep. For the sake of your sanity, especially when it comes to alarms that can't be turned off, you'll want to ensure this stability. You may need to tweak basal insulin rates, but it's well worth the effort. A stable night is advantageous for two reasons; it gets the day off to a good start and helps your average BGL for that day. If my average is higher than usual towards the end of the day, there's a good chance that a bad night was a contributing factor. Ultimately, the goal of using a CGM is to have better stability and control of your blood glucose, which shows in HbA1c results. If the first 6-8 hours of your day are spent at a healthy blood glucose level, that will go a long way to improving your HbA1c. The second most important piece of advice I can give is to bolus (or inject, if needles are your thing) well in advance of eating a meal. Something you'll likely notice during the early days with a CGM is the delay between giving insulin and when it takes effect. If you give insulin for food at the time you begin to eat, you'll see that the food takes effect well before the insulin does, resulting in a spike in your BGL, followed by a dip 60-120 minutes later as the bulk of the insulin takes effect. I've found that giving insulin 20-30 minutes before a meal is the best way to avoid this spike. Your mileage may vary, but I haven't had to worry about my blood sugar falling too fast when bolusing up to half an hour before a meal. Any earlier would put you at risk of a hypo before the food takes effect, so I don't recommend it. Avoiding this spike will not only make you feel better but will help stabilise your blood sugar after eating. The idea is that you then consume food around the time the insulin starts to act in your system, and they balance each other out. It's never perfect, but it may be the difference between "spiking" to 9 mmol/L rather than 13 mmol/L. Avoiding these higher blood sugar levels a few times a day will undoubtedly benefit your HbA1c result. It's easy to bolus early when you know what you're going to eat at a prepared meal such as an at-home dinner. Eating lunch at uncertain times at work, or eating out and not knowing what to expect can make this quite difficult. You can't bolus 30 minutes in advance of a meal when you don't know what time you'll get around to eating, nor can you bolus correctly for a meal you've never seen before - as is the case when you eat at a restaurant. Years of diabetes management has taught me to guess the carbohydrate content of meals at a glance. Apply this skill to a plate of food you haven't seen before, and you might be able to guesstimate carb quantity in advance. For example, it's a safe bet that a plate of pasta will have a non-zero amount of carb, whereas fish and veggies will have very little carb. In the case of the former, I'd be looking to bolus early for approximately 50% of the carbs I expect in the pasta. A typical bowl might have 50g worth of carb, but as you don't know the portion size, nor when the meal will arrive, I don't recommend bolusing for the full 50g in advance. It's unlikely a bowl of pasta will have <25g, data-preserve-html-node="true" so start by bolusing for that in advance. When the meal arrives, you can use your amazing carb-guessing skills to deliver insulin for the rest of the meal. This has been working for me. Again, it might be different for you. Don't bolus early if your BGL is low to begin with, or if your BGL tends to drop right after bolusing. In my case, I know that if I give insulin for 25g carb, I can afford to wait 30 minutes before eating and still avoid a hypo. It's not always practical to bolus in advance, and that's okay. It isn't the end of the world - after all, it's what you've been doing for years, isn't it? If you're not confident guessing the carb content of a meal in advance or bolusing in advance of eating, you can either choose low-carb food to avoid a spike or just enjoy the meal and accept that a spike now and then is a part of having diabetes. Just be sure to check in with your BGL a few hours later and correct if need be. Plain Weet-Bix (a cereal with effectively no sugar [~2.5%]) and low-fat milk will send my blood sugar soaring immediately after breakfast. It is classified as a medium-GI food. Protein shakes have also been cut out entirely, despite there being no sugar in the protein powder itself. 200mL of milk and a small scoop of ice-cream is enough to raise sugar levels fast. Low-GI bread is a lifesaver. Two slices of Lo-GI bread from Bakers Delight has replaced Weet-Bix as my breakfast, and this has a noticeably positive impact on my blood sugar. I rarely spike after breakfast, and if I do, it's to ~9mmol/L, instead of 14mmol/L. Choosing low-GI foods where possible will help to stabilise your blood sugar levels as these foods release energy slower over a longer period, which is more aligned with how insulin acts in your body. I'd also recommend not eating too much carbohydrate in a short space of time, as it's harder to guess carb content and the effect it'll have on your body. Ideally, you won't see a noticeable spike in your blood sugar after eating, but the ideal is rarely possible. The next best thing is to minimise the spike, and that can be done through a combination of giving insulin early enough, not overeating carbs, and choosing low-GI food. There are a few things worth noting about the sensor itself that would've been handy to know from the beginning. The Dexcom CGM sensor is meant to last seven days. I've had it last for less time and fail to give readings (fortunately Dexcom were great about this and offered a replacement), but also considerably more - up to 14 days. I don't suggest leaving it in longer the recommended seven days, but note I had success the one time I tried it. I've only been able to try it once as often the tape has started to peel after 5 or 6 days, so the sensor is ready to be removed on day 7. If you're inserting the sensor in your stomach, it's most likely that the top of the tape (closest to your chest) will peel first, so when fixing the tape, I'd recommend sealing the top edge first to ensure it's stuck in place. Inserting the sensor doesn't hurt, so don't be afraid. This is a case of do as I say, not as I do - years of changing insulin pump sets has me conditioned to expect pain far too often. Surprisingly, the Dexcom sensor insertion is completely painless. There's only been once where I've found it more noticeable than a tickle, but even then it couldn't be felt after a few minutes. The insertion device is quite large and can be intimidating, but it isn't as painful as it seems. I'm the first person to praise the convenience and luxuries afforded by having an Apple Watch. The potential of the Apple Watch as a health and fitness device is truly unlimited. A long-term hope is that the Apple Watch can perform non-invasive blood glucose monitoring, but until that day we've got invasive solutions. Dexcom's integration with both iOS and watchOS is impressive. The apps are reliable, and that's exactly what you want from a medical device. The Dexcom app for Apple Watch supports a "complication" - this means it's possible to view your blood glucose reading in real-time on the face of your Apple Watch, with no need to open the watch app to see this data. At first, I thought there could be no better feature. After a while, I realised it's unhealthy to be glancing at my watch every five minutes to get an update on my blood glucose level. Focusing on this constantly, and anxiously watching it rise or fall, is no good for anyone. You survived up until now without such frequent updates, so you'll be okay to hide the complication. Opening the watch app every hour or so should still be enough for you to see significant benefit from wearing a CGM without going insane. Again, this is a case of do as I say, not as I do. I'm a lot better at not constantly checking my watch than even this time last month, but it's still more of a distraction than I'd like it to be. Continuous glucose monitoring is, on the whole, fantastic. That doesn't mean it isn't overwhelming at times. There have been many occasions where I've thought it's more trouble than it's worth. Since, things have settled down mainly thanks to bolusing early, and trying to get my levels stable before sleeping. If you feel overwhelmed, I encourage you to take a few days off from wearing it. A great time for this is in between taking out the sensor and putting in a new one. There's nothing wrong with going back to doing things the old way for a while. Sure, your levels might spike, but that's been happening for years, and at least you won't be anxious as you watch your BGL climb after a meal. You'll know when you're ready to put it back in. CGM has more of a learning curve than beginning to use an insulin pump does, and like an insulin pump isn't a device for everyone. Everything mentioned thus far is something that I've learnt from experience with the CGM. It's only been a couple of months, and I'm sure that the learning will continue to be plentiful for a long time to come. Ultimately the best way to know what works for you is to try yourself. Things won't work perfectly at first. I could not have imagined how frustrated I would be by the alarms after a few weeks of wearing the Dexcom. I'm looking forward to an update to the Dexcom Apple Watch app which brings the ability for the Dexcom to send data directly to an Apple Watch. Currently, your phone must be in range of the Dexcom to receive updates, which are pushed from the phone to the watch. As of watchOS 4, it is possible for a Bluetooth health device to send data directly to the Apple Watch, and Dexcom have said they will support this feature. Make it clear that by acknowledging an alarm in the iOS app, it will be silenced. I spent days thinking it was impossible to silence alarms, and that I was stuck with being woken every five minutes until my blood sugar rose high enough to stop the alerts. Time of day settings. Living in constant fear that your phone will sound an uncontrollable alert is no fun. People have occasions where they don't want to be alerted to things - at work, in meetings, at the cinema, etc. Silent alerts are possible for all but critical low alerts on the Dexcom. This is a start but not perfect, as you then have to remember to turn them on again or else you won't be alerted when you actually want to be - such as overnight. Almost 17 years of diabetes means that if I'm awake, I can tell with 99% accuracy that my blood sugar is low or high. How high, or how low? Who knows, that's what the Dexcom (and previously, finger-pricks) are for, but if I'm awake I'll be able to feel the onset of low or high blood sugar. I'd love to be able to tell the Dexcom to send audio alerts between 10 pm and 6 am, but no other time. Silent notifications to my Apple Watch and iPhone will suffice the other 16 hours of the day. To extend on the above, there's the concept of "Low" blood sugar in the Dexcom app. This value is defined by the user (I have mine set to 3.7mmol/L), and anything under this reading will trigger an alert. There's also an "urgent low" alarm - set to 3.1mmol/L - which can't be changed, nor silenced under any circumstances. It's a long shot, and there are other things which should be a priority, but I'd like to see smarter use of these settings based on a wake-up alarm. For example, I absolutely should be alerted to a level of 3.6mmol/L at 2 am. However, if my BGL drops to 3.6mmol/L at 5:30 am, and the Dexcom knows my alarm is set to go off in the next 30 minutes, the fact that the low isn't "urgent" means it doesn't need to wake me. I have no issue with it waking me at any time if the level is considered an urgent low, of course. This is simply something I'd like, and I realise everyone would have a different preference. On a similar note, a true wildcard feature would be integration with a sleep tracker on the Apple Watch (AutoWake?). This could mean that if your blood sugar was low and steady, but not falling nor urgently low, it would wait until the end of a sleep cycle to wake you. Let me tell you, Dexcom shows no mercy and will wake you 40 mins after falling asleep if it has to. That is not a time one would want to be woken if it can be avoided. Again, these business rules are tricky to decide, and this is no easy task to tackle, but in a world where Dexcom have infinite time and resources to develop their mobile apps, I'd like to see it happen. As a general rule, fewer app settings are better, but not for a medical device like the Dexcom, which plays such an important role in the life of the wearer. Fine-grain control is exactly what's needed here, and I find the existing control over alerts to be frustratingly limiting. Continuous glucose monitoring can benefit every person with diabetes in a slightly different way. For a young child who may not have yet developed the ability to detect low blood sugar, CGM does this for them. For that child's parents, they can send their child off to school knowing that the CGM will catch irregular blood sugar and alert the child sooner than a teacher might notice the child's pale face and scattered concentration, which are both indicators of low blood sugar. For someone my age, CGM is about the freedom and flexibility of not having to carry a blood glucose monitor everywhere I go, but more importantly, it's about smoothing the fluctuations in my blood sugar levels leading to better control which will (hopefully) mean fewer complications from diabetes later in life. For someone prone to fainting when their blood sugar falls, CGM is about saving their life, be it overnight, or just one afternoon while excitedly watching the footy and not realising their BGL has dropped. CGM has infinite potential to benefit people with diabetes, as well as those without it. Learning what works best for each individual takes time, and is no small task. Had I known the tips above this time two months ago, I would've had a much easier time using a CGM in the beginning, and I hope that someone new to using CGM finds the tips to be beneficial. Day three. I'm starting to get used to the CGM and learn more about how it's going to fit into my life. Today was a good test for it, as I was out of the house for an extended period. This morning began with the first run I've been on since getting the Dexcom. Having an Apple Watch with a built-in 4G connection meant I didn't take my phone. A side effect of this was not being able to see my glucose levels while running, as the Dexcom connects to the phone but not to the Apple Watch. This will change as a result of watchOS 4 and changes to CoreBluetooth, but as I type this those features aren't supported yet. The Dexcom sensor is comfortable enough for day-to-day activities. I haven't been able to feel it when at the gym, or when sleeping (which is what I was most concerned about. It has brushed up against the seatbelt in the car which can get uncomfortable, but it's no big deal. Where it's been most uncomfortable was on this morning's run. There's no other way to describe it other than it felt heavy. I've not felt this way about an insulin pump set, but the Dexcom is absolutely noticeable - and somewhat uncomfortable - while running. Again, not a huge issue, but it's something to note. After years of being trained to complete regular "finger pricks" around lunch time, losing this mindset is taking some time. With the CGM, I can just eat. As strange as that sounds it's true. There's no longer a prerequisite to eating. Similarly, earlier today I found myself feeling a rise in my blood sugar. It was only minor, and usually I wouldn't worry about it. With the CGM, I was able to glance at my wrist, note that it was slightly higher than it should be, and give a dose of insulin through the pump. Not having to draw blood to get this information is helpful. As I've mentioned previously, it is recommended to calibrate the Dexcom sensor with a manual "finger prick" every 12 hours. Being out of the house for so long today meant that these two calibrations would occur about 16 hours apart. That hasn't stopped the Dexcom app from sending me a notification every five minutes since 6 pm this evening reminding me to, "Enter BGL meter value." There seems to be no way to clear this without entering a false calibration - which I'm reluctant to do. On the positive side, these notifications aren't making audio alerts. Another positive is that all of the calibrations so far, except one, have been within +/-0.5mmol/L of the current Dexcom sensor reading. It's reassuring to know that it's accurate. Today was the best day I've had so far for learning what makes the CGM useful. Highs and lows are unpreventable for someone with type 1 diabetes, but a CGM ensures you're on top of these swings and can help you recover from them faster. The highs won't be so high. Nor the lows so low. It's about the convenience of leaving your blood glucose monitor at home for the day. Did I mention? I haven't seen the thing since seven this morning - which is almost certainly the longest time I've spent away from one in over 16 years. I feel the need to begin by stating that this is in no way a complaint about the Dexcom G5 continuous blood glucose monitor and that I am extremely fortunate to be wearing such a device that gives me continuous, real-time data. It works well. Being able to see this data in real time will undoubtedly lead to better overall control. It's already saved a hypo. This post is simply what I've discovered when trying to write software based on the data provided by the Dexcom. As a software developer, the thought of the data collected by the Dexcom is exciting. The Dexcom iOS app works well but isn't perfect. That's okay as long as there's access to raw data. 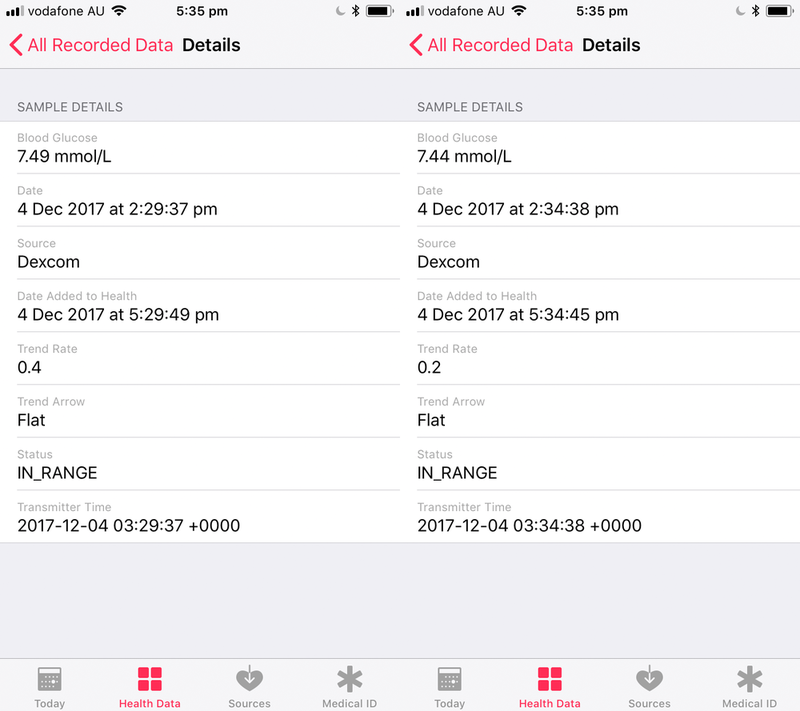 In theory, access to all of the readings off of the sensor would allow me to build an entirely custom app for viewing real-time glucose readings on both iPhone and Apple Watch. This theoretical custom app would also include support for my preferred Apple Watch complication, as well as more granular control over notification and particularly the sounds they make. Another possibility would be a custom companion app, so that my parents could check in with my glucose level overnight. There are countless possibilities. My first thought was to build something that pulls data from HealthKit and work with it that way. The Dexcom app currently writes data to HealthKit at a delay of an almost-perfect three hours. I addressed that in yesterday's post. While that is okay for an app that analyses longer-term data and trends, it isn't helpful for the projects I had in mind for today, with the goal being to use data that's as real-time as possible. A quick Google search this morning for "dexcom api" lead me to realise they do have a way for this data to be accessed by third parties, so I decided to play around with it. Many hours later (too many of which spent getting the authentication right), I wondered why the simple app I'd built to return data captured in a given period wasn't working. That's when I came across the following on the Dexcom website. That explained why today's efforts were failing. It's disappointing as a developer, but I'm sure there are valid explanations as to why. As an FDA approved device, there are processes in place, and lots of regulation they have to adhere to before anything gets done. I can also confirm that this problem can't be addressed by simply changing your Dexcom account address to a United States one. I'm a little deterred knowing that there isn't a reliable way to access real-time data from the Dexcom sensor. It doesn't matter much - the official Dexcom app works reliably and is enough for most people most of the time. A possible next step is to try and read data straight from the Dexcom sensor via Bluetooth. Some quick searching earlier this evening tells me this may be possible, but that's a project for another day. Following on from yesterday's post, today was CGM pickup day. This involved visiting the hospital to collect the first batch of supplies for the CGM, as well as set it up, and learn how to use it. This is more of a "first impressions" post, as it will take a while to be able to assess its usefulness in managing glucose levels overall. 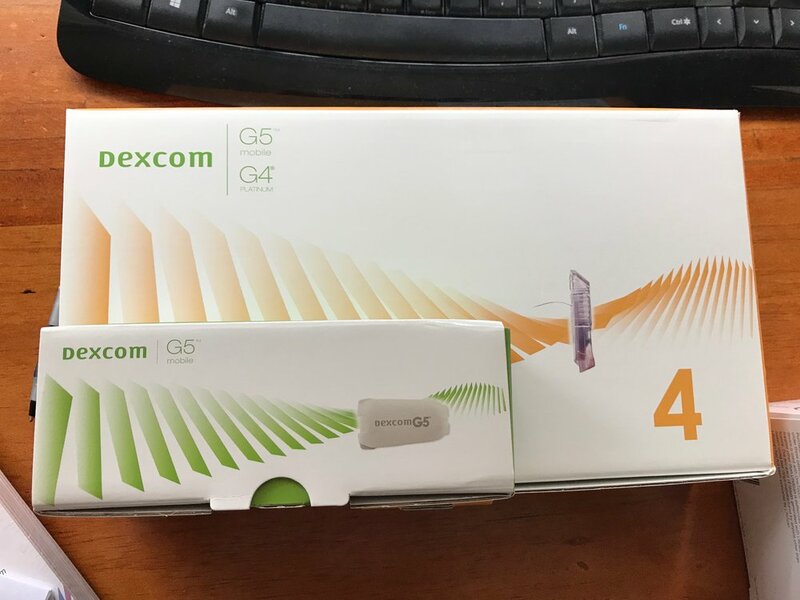 The smaller box contains the Dexcom transmitter. The larger box contains the sets. Surprisingly simple, there are two parts to the Dexcom G5 CGM. There's the transmitter (shown above as the smaller of the two boxes), and the "sets" - the piece holding the cannula that attaches to your skin. The Dexcom iOS app has a straightforward onboarding process which ends with you linking the transmitter device by scanning a barcode on the back of the box. This is used to fix the set to the body. It looks scarier than it is. Nearly lifetime of needles, nor over eight years of inserting cannulas for an insulin pump meant I felt calm when seeing the insertion device. It worked fine and fortunately didn't hurt, but that doesn't mean it wasn't intimidating. You can wear the set either in your stomach or on the back of your arm. I choose stomach, as I'm comfortable with putting the sets for my insulin pump there and figured it's a safe option. Once it's in, you clip the transmitter device into the plastic enclosure of the set where it sits for the next week. The transmitter lasts three months, while the sets are swapped every week. It's bulky. See the photos above. It's about twice as thick as the insulin pump sets I'm used to. It's not uncomfortable, but my biggest concern is that it'll be easy to knock out. For reference, sensor and the set combined are about a thick as the width of my index finger. Once the sensor is inserted, it takes two hours to warm up. From there, it asks you to do two manual blood glucose readings, one after the other, to calibrate the sensor. You input these into the Dexcom app, and from there it gives you your first reading. After that, it senses your glucose level every five minutes and sends that reading back to the phone. Interestingly enough, Dexcom makes the only CGM sensor that is accurate enough to trust as a replacement for blood readings. Despite that, two manual blood readings are still required per day to keep the sensor calibrated. The iOS app is fairly simplistic. It shows you your current reading, along with an arrow indicating the trend of the readings. It's worth pointing out that, for those who care, the iOS app is still running at iPhone 5 resolution - not yet updated for 4.7" and 5.5" displays, let alone the 5.8" screen size of iPhone X. 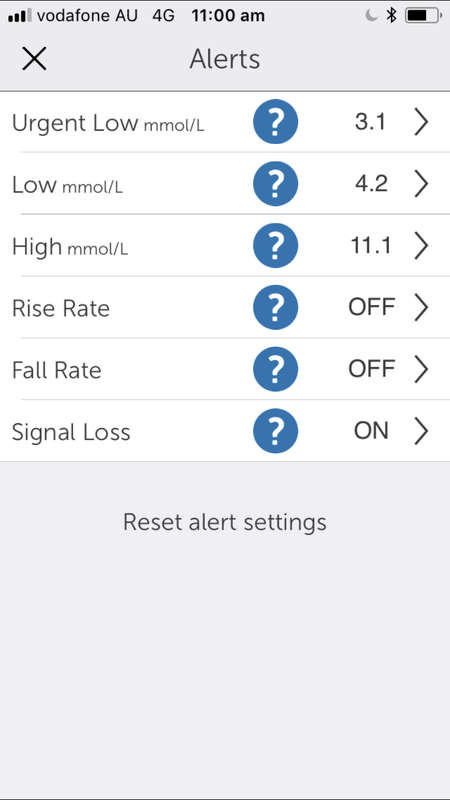 The Dexcom app offers real-time notification alerts for glucose levels that are either too high or too low. These somehow bypass silent mode, do not disturb mode, and the system volume level on iOS. I've received a few of these notifications already (don't judge - the CGM should help reduce the number of poor readings I have) and it's safe to say they're extremely annoying. My phone has stayed in silent mode from the second I got a smartwatch four years ago, and I don't like the fact that notifications are making noise again. More granular control over this would be appreciated. It may be useful overnight to alert me to hypo (low) glucose levels, but I wish there was a way to silence them. A tap on the wrist from the Apple Watch is all I need to see an alert and action it. For a variety of reasons that I won't go into here, I've used the "Simple" Apple Watch face (shown in the first image above) almost every day for two years. I am also of the opinion that having an Apple Watch and a Dexcom CGM means you are obliged to use the complication to get your BGL at a glance. Unfortunately, the Dexcom complication doesn't support the Simple watch face. The closest alternative is "Utility" - shown in the second image above. It means I lose having my step count on the watch face, as there's space for one less complication, but I think that's a worthwhile tradeoff for now. The only watch face that allows me to have the Dexcom complication as well the other complications I'm used to is "Modular" (third image above) but I'm not a huge fan of that one. I might use it as my overnight sleeping watch face but will try to avoid it during the day. It's too early to tell for sure, but the complication seems to update every 10 minutes, which lines up with every second reading recorded by the Dexcom sensor, so it's frequent enough. Occasionally I have noticed that it fails to update, and instead shows three dashes "---" (shown in the fourth screenshot above). Another reason for choosing the Dexcom CGM, other than it being the most accurate, was that it's the only one to sync to a phone. If you have an iPhone, not only does it sync to the Dexcom app on your phone, but also optionally can write the data to HealthKit. This is perhaps the most strange thing I've discovered about the Dexcom so far. The Health screen reads, "Dexcom G5 Mobile information posts to Health with a three hour delay." My first thought upon reading this was that it only writes to HealthKit every three hours - i.e. eight times per day, maybe in an attempt to save battery? As far as I've been able to discover, the Dexcom app writes to HealthKit every five minutes but writes the reading from three hours ago. I'm not sure why this is, and I'll continue to try and find out why. It feels arbitrary. As can be seen in the above screenshots, a reading recorded at 2:29 pm was written to Health at 5:29 pm, and a reading from 2:34 pm was written to health at 5:34 pm. I've still got a lot to learn about the Dexcom CGM. The best way to use it, how to interpret results and trends, and how it fits into my life all remains to be seen. Some sections may have sounded a bit like a complaint, but I assure you it's just an expression of my initial impressions. I am in no way complaining about the bulkiness of it, the missing "Simple" complication, nor HealthKit sync. I'm in a very fortunate position to have a CGM, and these are simply the things that have stuck out to me that I wanted to share after six hours of use. Continuous glucose monitoring, so I'm told, is life-changing technology for people with type 1 diabetes. I spoke to someone last week who told me her HbA1c result (essentially an average blood glucose level over three months) was down to 6.1 mmol/L from 8.1 mmol/L. That's 110 mg/dL and 146 mg/dL respectively. I've heard similar results from others. That is no small improvement, and on top of feeling better in day-to-day life, it dramatically reduces the chance of developing complications from diabetes later in life. The range of continuous glucose monitors (CGM's) available now are all invasive, meaning they puncture the skin to work. I've written before about what non-invasive blood glucose monitoring would mean for people both with and without diabetes. The idea excites me beyond belief. However, it may still be years away, and for now, the choice is whether someone sees the benefits of CGM enough to accept the tradeoffs. If someone with diabetes is also wearing an insulin pump, expecting them to live with another cannula in their body (generally either in the stomach or back of the arm) may be a dealbreaker. Inconvenience aside, the cost is probably the most significant factor preventing more people from wearing the current CGM's available. Diabetes Australia says the cost of CGM, including sensors, is around $5000 per year. That's no small amount of money and puts the possibility of wearing a CGM out of reach for many people. With some notable exceptions, it's nice when an elected Government follows through with an election promise. The current Australian Federal Government committed to wholly subsidising the cost of CGM devices for Australian's with type 1 diabetes who are under the age of 21. This is thanks to tireless lobbying from the Danii Foundation. Fortunately, I am eligible for the subsidy for the next 11 months. After speaking to the doctor at my last checkup, she agreed a CGM would be beneficial, and I'm scheduled to have have one set up tomorrow (4th December, 2017). The CGM model is the Dexcom G5, which was recommended as it's the most accurate, and can replace all but two "finger-pricks" per day for checking blood sugar. It also transmits data via Bluetooth, and as a result, will sync the data to HealthKit on my iPhone and Apple Watch. The ability to store this data reliably for future reference is a definite advantage. This is an exciting time when the possibilities are considered. Improved control and management of blood glucose levels will almost certainly lead to advantages I can't even think of at the moment. Because of the integration with iPhone, Apple Watch, and HealthKit, I also plan on writing about it on this blog. Those posts will likely focus on the integration between the Dexcom sensor and this technology, as opposed to how CGM is affecting the management of diabetes and my blood glucose levels. On the other hand, a bulky sensor may be deemed not worth the tradeoff. I'm curious to find out. While I've got your attention on this topic, we're still raising money for JDRF. Their research leads the way in working towards a cure for type 1 diabetes. Any amount you've got to give goes is greatly appreciated. You can read more, and donate here.